I recently read Ache and was seduced by the emotions and the poignantly written characters; individuals, families, communities, animals and the landscape – a vivid and bold major character in this novel. The compelling writing will touch all that read it. I highly recommend this read. Welcome Sasha Wasley to my blog. I was caught by your blog’s title and immediately tempted to find a way to match the theme – at the same time as introducing Dear Banjo to your followers. As I love wine, and my book is a love story, I felt it was a great opportunity to talk about … wine and love! My favourite tipple is a fresh sauvignon blanc, and I love both the Australian and New Zealand varieties. In my book, however, my main characters love red wine. The story is set in Mount Clair, a fictional town in the Kimberley region of WA. It’s hot and humid up there, and I imagine red wine drinkers are in the minority, so this was a nice little trait for Willow and Tom to have in common. Let me share the scene where their love of red wine is particularly relevant. Formerly best friends, the two have experienced a long rift, during which they did not have any contact at all. But they’ve made peace and are friends again in this scene, and Willow and her family visit the neighbouring cattle station for Tom’s birthday barbecue. There was a small bunch of people Willow didn’t know, presum¬ably Tom’s friends from town, sitting in a group. Willow went to say hello to the Forrests. Tom, already cleaning the barbecue, offered her a drink. She followed him into the house and he took her into the spare room. He bent down to open what looked like a dark cabinet in the corner and she heard the clink of bottles. He straightened and showed her what was in her hand. She gasped. ‘I’ve got something even more special for my thirtieth.’ He opened the fridge and pulled out another bottle. The corner of his mouth was tugged up in an expectant half-smile. She couldn’t help a little answering enthusiasm. ‘Let’s do it!’ He had the corkscrew in his hand before she’d even finished speak¬ing. ‘Cork,’ she breathed. He nodded towards a cabinet against the wall and she opened the glass slider to pull out two big, dusty wineglasses. Spotting a pillow on the spare bed, Willow whipped off the pillow case and used it to polish the glasses. ‘Ours. Ours alone,’ she intoned and he doubled over laughing. They clinked glasses carefully and sipped, watching each other’s faces. Tom waited for her judgement, although she could see he liked it just from his expression. The wine was beautiful and she sighed with pleasure. ‘It’s the aged nectar of the gods,’ he said. He gestured towards his wine fridge. ‘Wait till my thirtieth. It’s just a shame I offered half to another living human,’ he added, narrowing his eyes at her in classic villain style. ‘You’ll be lucky to get half the bottle, sharing with me,’ she said. He laughed, but those blue eyes were on hers and they seemed a little intense. She sipped again, her body heating up uncomfortably. 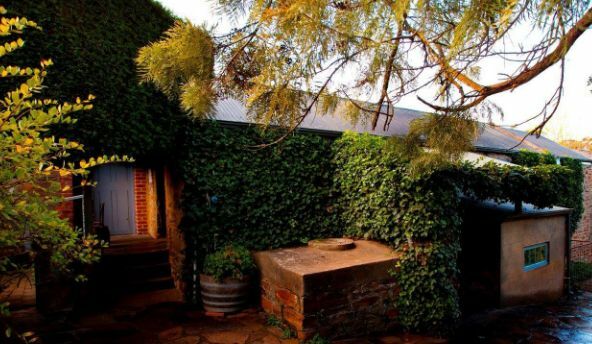 I went to visit the Henschke cellar door in South Australia during a visit to the Barossa region in 2009 and it was such a wonderful experience. Not only is the winery itself the most charming, picturesque, historical spot, surrounded by green valleys, vineyards, and those amazing German-style churches – but the wine is incredible. I stayed in Angaston, home of the famous dried fruit company, and I didn’t quite make it to the town named for my ancestors, Wasleys, which is in the same region. Sadly, the town of Wasleys suffered from terrible Pinery fire that ravaged the region a couple of years ago. I certainly want to go back and explore the area more thoroughly – the history and the buildings, as well as my own family heritage. And the wine may have a little something to do with it, too! 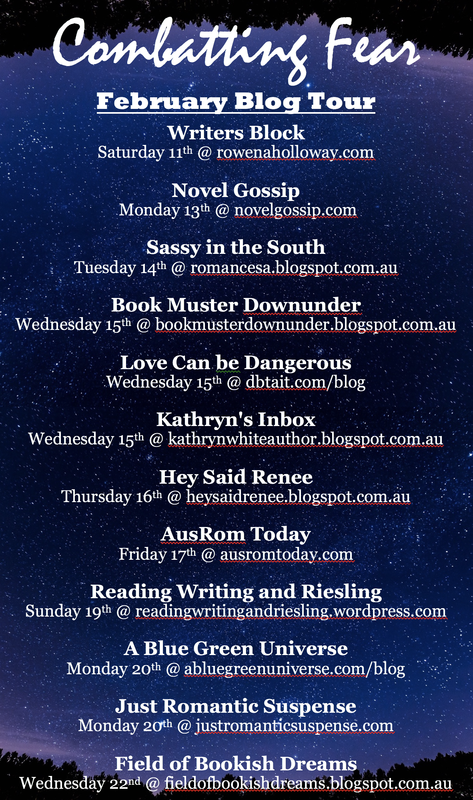 Thank you, Reading, Writing and Riesling, for allowing me to ramble on about love and wine, two of my favourite topics! I do hope your readers enjoy Dear Banjo. 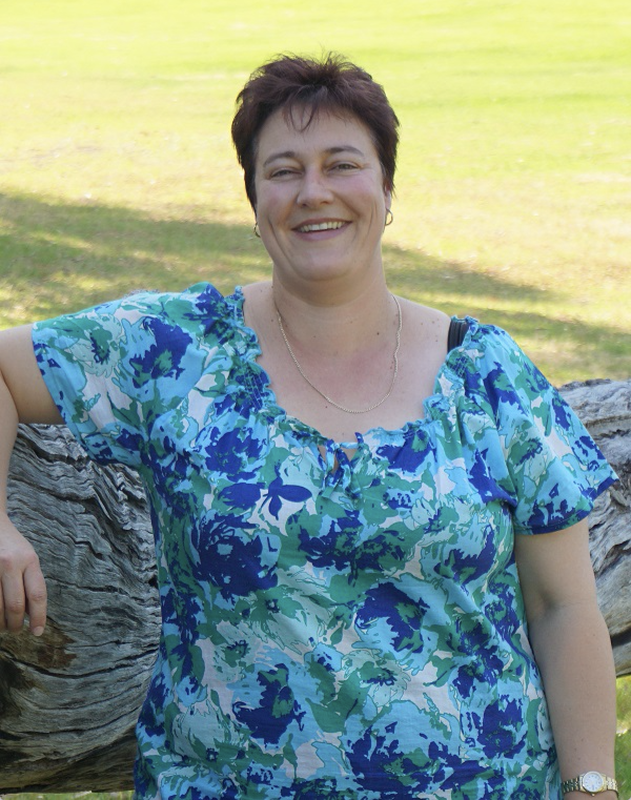 Welcome to my blog Sandy Vaile. 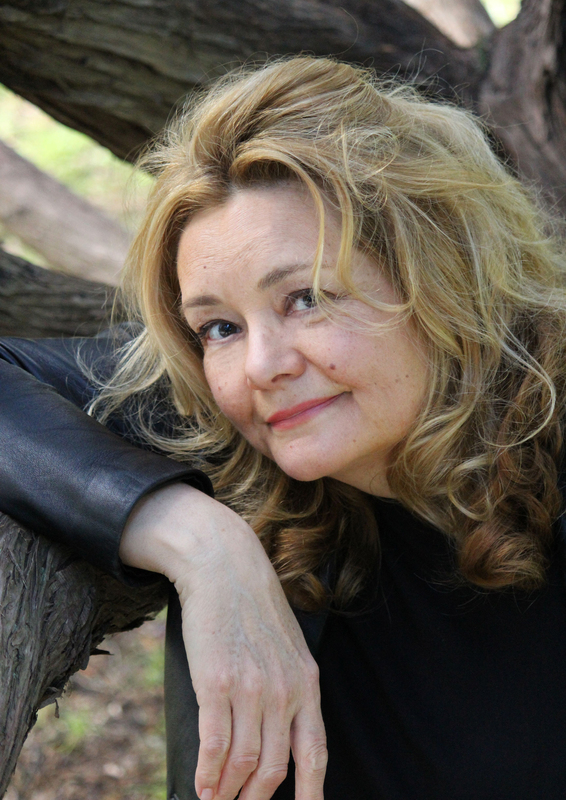 Sandy Vaile, author of romantic suspense, is here to chat about her new book, “Combatting Fear”, and what drives her. Sandy Vaile is a motorbike-riding daredevil who isn’t content with a story unless there’s a courageous heroine and a dead body. When she’s not devising horrible things to do to fictional characters, she writes procedures for high-risk industrial activities, mentors new writers through the Novelist’s Circle critiquing group, judges romance writing competitions, presents literary craft workshops, and writes the odd article and blog. 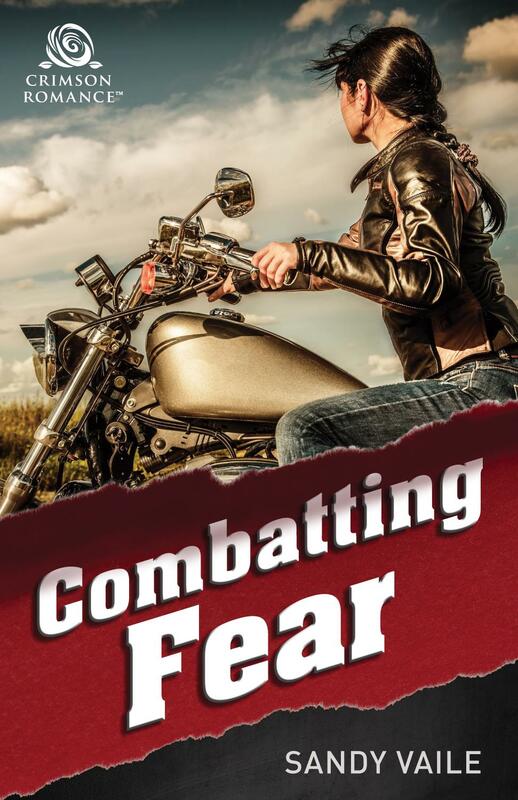 Combatting Fear is Sandy’s new book. How far would you go to save a child that wasn’t yours? Mild-mannered kindergarten teacher, Neve Botticelli, leads a double life. At home with her paranoid father, she is a combat trained survivalist who lives off-the-grid. When self-made billionaire, Micah Kincaid, storms into town in search of his four-year-old son, Rowan, he’s pushy, entitled, and stands for everything Neve despises. But something far more sinister than a cheating estranged wife, is lurking in rural Turners Gully, and it has its sights set on little Rowan’s inheritance. It turns out there is one thing Micah and Neve can agree on, and that’s keeping Rowan safe. As they work together to free Rowan, they glimpse beneath one another’s guises, and realise that falling in love could be even more dangerous than hunting deadly criminals. Thanks so much Sandy – I really love the personal connections a video interview brings to a Q & A. Join me in the blog tour that celebrates the launch of Sandy Vaile’s new book “Combating Fear.” There will be an interview (and vlog), a giveaway and my review of this action packed read. In a new feature to my blog, I am pleased to welcome A.K. 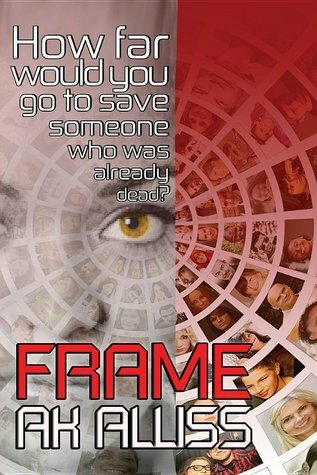 Alliss, author of Frame, to Books and Beyond Reviews as my first ever guest post. I had the pleasure of reading Frame, which I reviewed here. In this post, he discusses the period of time running up to the launch of a new book. So without further ado, welcome A.K. Alliss! Releasing a book traditionally, in a lot of ways, is a game. It’s a game of patience, of nail-biting worry and sleepless nights. To the new author, the world and characters that they have created are everything, but to everyone else, they are undiscovered, unknown and largely, unimportant. While that might sound pessimistic, the author will reach a point where they’ll have to posses a fairly pragmatic attitude when considering expectations of success. I discovered the joy of cake early in life. It was a rare treat and cake recipes were sacred texts, especially Winston Churchill’s 80th birthday cake recipe. These fruit cakes were baked in advance, stored in our antique sideboard and fed a bottle of brandy. No kidding, those cakes really liked to drink. Size wise the cakes were heifers and could only be handled by my mother. I watched in awe, as over the course of several days she drizzled brandy over the cakes. The heady aroma of drunken fruit cakes meant Christmas was about to be unleashed. My mother was devoted to the late Winston Churchill. He was right up there in her pantheon of gods that included Napoleon Bonaparte and the infamous poet, Lord Byron. Framed reproductions of Napoleon’s portraits graced our dining room. It was disconcerting – when I was on the telephone being sweet talked by some randy schoolboy – to find myself eyeball to eyeball with Napoleon. He had a suspicious stare, especially in his baby portrait. Even when I looked away, I could still feel Napoleon’s cold baby blue eyes boring into the back of my skull. In our house birthday cakes were usually sponge cakes. If time was short, plain sponge cakes were purchased and the packaging hidden deep in the kitchen bin. These shop bought sponges were disguised with fresh strawberries, jam and whipped cream. For adult birthdays, the sponges were slathered with coffee icing, whereas for children it was chocolate or pink icing. I’ve never managed to master the creation of sponge cakes. I recently consulted a clever woman known for her sumptuous sponges and delectable baked goods. Glenda maintains that one must sift the flour at least three times, or you’re not really trying. Apparently it is air that gives the sponge its lift – or as dedicated pillow plumpers put it – its loft. She was right. I wasn’t. I loathed her classes because she’d sucked all the joy out of messing around with flour, butter and eggs. To make matters worse I hadn’t confessed that the embroidered name on my starched kitchen cap wasn’t mine. There’d been a mix up in the needlework class and the teacher had pencilled the wrong name on my cap. I was an unassuming child raised in the English manner and rather than make trouble, I’d dutifully embroidered the cap. I then spent the following year inadvertently snubbing Mrs Sullivan when she called out my supposed name. My inattention resulted in mediocre grades for Cookery. Glossy fashion magazines frequently pose the question, ‘Why don’t French women get fat?’ There’s an entire diet book industry built around this dodgy question. After all, French cuisine is lauded for its exquisite gateaux, pastries and national dishes that rely heavily on butter and full fat cream. Interviews are regularly conducted with fashionable Parisian women, who swear they owe their petite figures to portion control. Treats are strictly monitored: a tiny piece of Camembert, one petite madeleine or a whisper of chocolate gateau. Strangely enough – even their dogs look lean. But you only have to leave the epicentre of fashionable Paris, and take a train to the outer suburbs or the provinces, to realise that not all French women are fixated on being Greyhound lean and hungry. Curvaceous French women can be seen dining in public, enjoying flavoursome creamy, garlic laden dishes and recklessly swilling down champagne and cocktails. For lunch, they publicly indulge in tasty charcuterie and chunks of Brie cheese. And at breakfast, the ladies aren’t shy about adding extra butter to their croissants. The sinful lusciousness of it all – sugar, carbs, alcohol, chocolate, butter and cream. Vive la France! Last year I was privileged to read the unpublished manuscript of AK ( Adam) Alliss’s contemporary novel, Frame. AK Alliss introduces himself, talks about his writing and discusses Frame in this short video. My review will follow shortly. Thanks so much for sharing you story with us Adam.